Upma is a complete meal in itself. 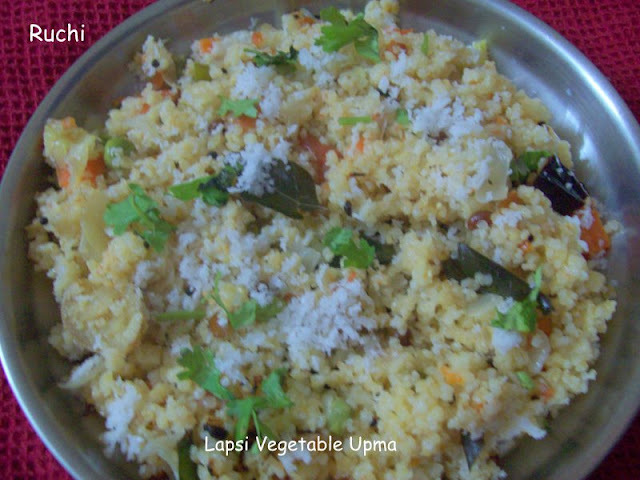 When you make upma with vegetables, coconut it comfortably gets into the "healthy food". 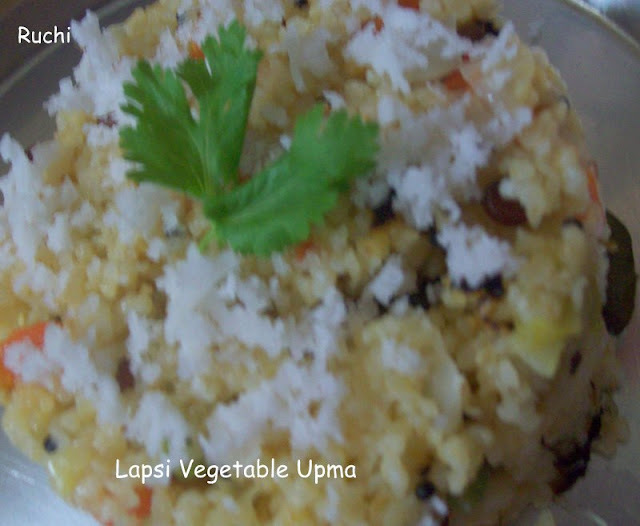 Preparing upma with lapsi/ broken wheat is a great way to include it in our diet. It is an excellent source of fiber and is also low in fat .It is not only healthy but also a filling breakfast recipe. 1.Heat oil in a pressure cooker and add mustard. seeds, when it splutters, add urad dal , channa dal. 2.Then add curry leaves, once it starts to pop add the grated ginger, green chillie,onion and saute till the onions become translucent. 3.Add the green peas, carrot,beans broken wheat and saute for few minutes Then add water, salt and mix well. Close the lid of the cooker and cook it for 1-2 whistles. 4.Once the pressure cooker cools, open the lid and let it cool and set for a few seconds. 5.Tranfer the contents of the cooker to the serving vessel and Add ghee then garnish with ,coriander,grated coconut and lemon juice to it and mix well. 6.The broken wheat/lapsi vegetable upma is ready. Serve it hot with coconut chutney. Wish to start my day atleast twice a week with this healthy upma,inviting.